Thaw tuna steak/fish and cut into cubes. Place in a dish that will allow all of the fish to to lay in 1 layer at the bottom. 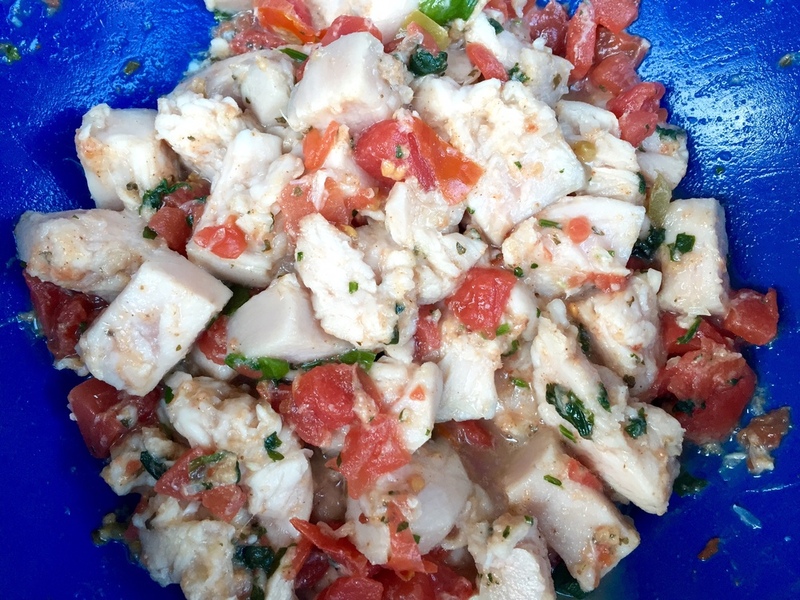 Pour fresh squeezed lime juice over the tuna in dish, cover, and allow it to sit over night in fridge. The acid from the lime juice turns the fish from being raw to a cooked consistency. In the morning, stir the fish in the lime juice and put back in fridge. 1 hour prior to dinner, drain the fish out of the lime juice. Mix the tuna, Ro-Tel, Island Vinaigrette, cilantro, and green onion in a bowl. Place a fridge and let sit for 1 hour. Serve with tortilla chips and enjoy! I like to eat my ceviche in a bowl, crumble tortilla chips on top, and eat with a fork! Some like to dip the tortilla chip in the bowl and scoop ceviche onto chip and eat. You can get creative with extra ingredients and spices. My Island Vinaigrette adds a perfect citrus, spicy, cilantro flavor. I love cilantro so I add a little extra! I also keep my cilantro and green onion already chopped and in the freezer. When I need them for a recipe, I just take the amount I need out of the freezer and add to my meal.